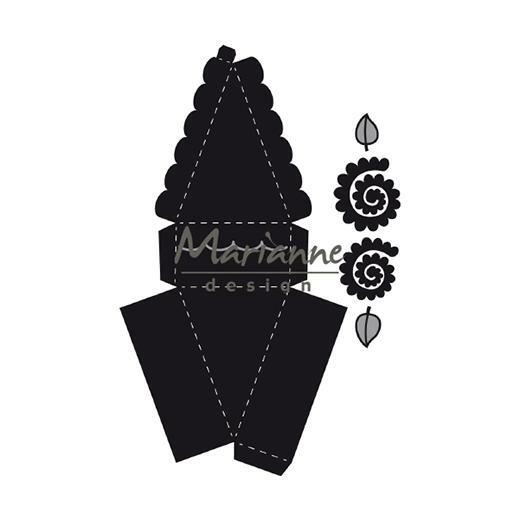 Marianne Design Craftables are thin metal cutting dies to be used with a die cutting machine to quickly and easily cut beautiful shapes, frames and borders for card making, scrapbooking and other craft projects. Craftables cutting dies will cut paper, card, craft foam, thin craft metal foils and wool felt. Many of the Marianne Design dies also include additional design embossing details which will be shown in the product pictures in a secondary colour. Embossing detail areas can easily be inked or chalked (with or without embossing) by leaving the die cut piecing in the die whilst the colour is added after which the piecing is removed and the die wiped clean. This pack contains five cutting dies to die cut the piecings needed to assemble and decorate a small 3D cake favor box and rose embellishments. 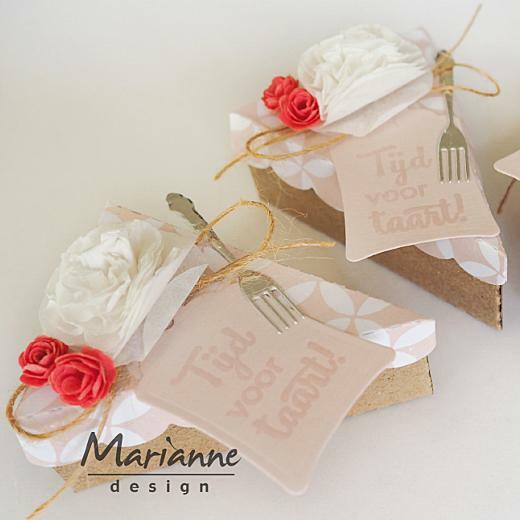 The constructed cake slice favor box will measure 52mm x 72mm x 30mm. It will be an attractive size to hold sugar almonds or other treats but not large enough to hold a slice of real cake.